Before I get into the manufacturers, I am going to talk briefly about what color to prime in, what technique to use, whether 100% coverage matters or not. The simple answer I have is - experiment. Whatever works for you is the right thing to do. Regarding colors - for years I was a firm user of grey primer because it allowed me to paint whites, yellows, reds and blacks onto the same model with equal ease, more recently (with the acquisition of an airbrush) I have shifted to zenithal white over black for the quick shading help. 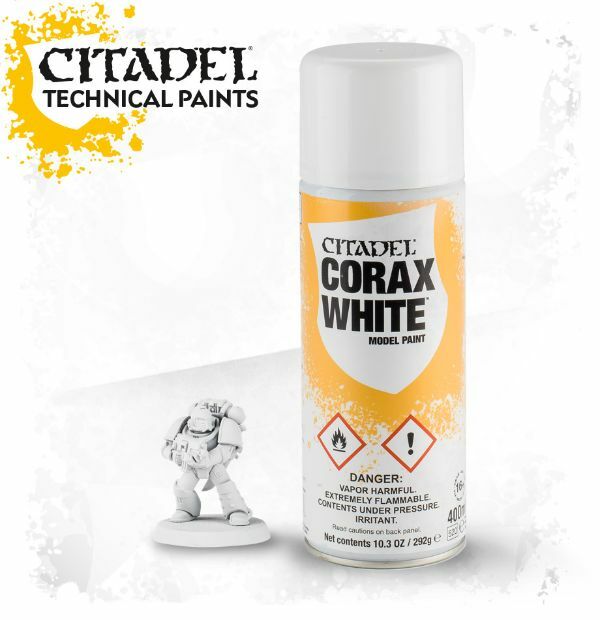 For your first ever model, maybe prime white, it will make painting over it as easy as possible although there are definite drawbacks, it's a good starting point. Similarly if you have a single colour that is the majority of the model (eg Green for Orcs) then try priming with that and save yourself a ton of time and effort. 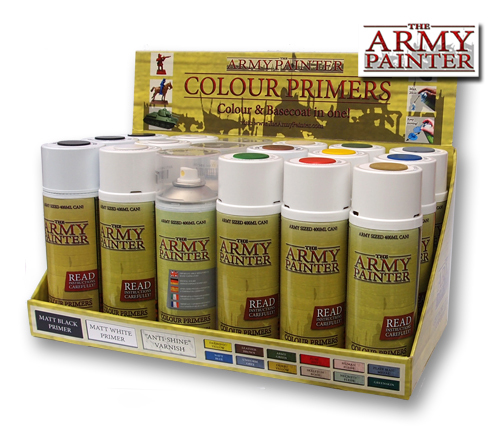 When it comes to technique and coverage, technically you only need a slight amount of primer on the model in order to have other paints adhere to the model, application depends on the model material, primer, humidity, temperature and wind level. All of these things are complex and interdependent and experience is the best teacher. Wash your miniatures with soap and water then let them dry thoroughly before getting started. Plastic miniatures tend to take primer best, then resin with metal being the hardest as paint tends to chip/peal most easily. Some plastics/resins are exceptions to this rule. There is NO SUCH THING AS SHAKING THE CAN TOO MUCH! You know how they say shake for 5 minutes on the can? That's there for a reason. Time yourself - I'll bet you never normally shake for that long. Leave the models a couple of days to cure. 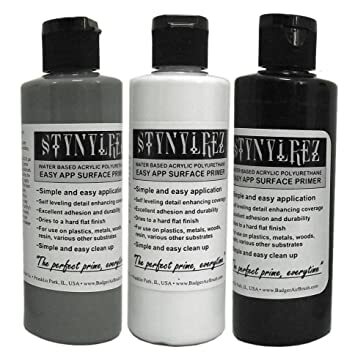 I find this particularly important with my airbrush primer but is beneficial for all primers. 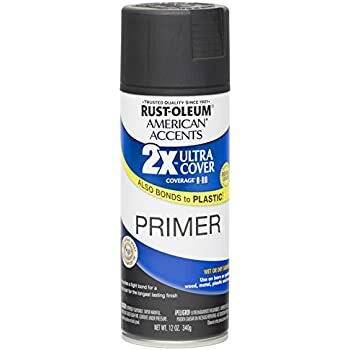 Primer is not just acrylic paint - it has additional chemicals to help it bond to the base material - you want to let these cure properly to be as effective as possible. If you are using a manufacturer that you haven't tried before - test on something first (Space Marines from any 40k starter box are my guinea pigs of choice). Too close is better than too far. I may get some grief for this one but my experience is that a well shaken can of primer has a decent amount of propellent that can leave a model looking over sprayed at first but then dries to a good finish. Priming from too far gives that dry, dusty finish which will just fall off. For the same reason lots of small batches is better. Spray from all angles - another somewhat contentious one here. I like to have a solid layer on my model before I start painting. This is because I tend to start with black these days, the value being - it gives instant shadow. BUT that only works if the deepest recesses are actually painted and this can be hard, lots of layers from lots of angles makes this much more likely. Some other painters will do a quicker prime and then hand paint the recesses which can be a great (and often faster) alternative. USE A MASK!!! Ok so I am known among my friends and family for having a reckless disregard for personal health and safety - I smoke, drink to excess, use power tools with little to no safety equipment and generally seem hell bent on shortening my life span. Do you know what I do? I ALWAYS WHERE A MASK WHEN USING SPRAY PAINTS (or an Airbrush... actually especially an Airbrush). Want to know what really terrifies me? The thought of a layer of plastic forming over the inside of my lungs until I am unable to breathe, slowly suffocate and die. Now while it may not, in reality, happen quite like that... I don't want it to happen at all. Please use a mask - and preferably a good quality one. One last thing - a word on Reaper Bones - I have never really worked with priming Bones plastic, I got an airbrush before I got any of these figures and Stynylrez works great for me. Please ask around online for advice specific to these models before attempting priming. I have 20 years of painting with aerosol can primers and most of this was using GW primers... and then I tried a car primer... and never went back. GW primer is good, well formulated and very very expensive. I don't even feel as though the color matching is that good for their paint range so there really is very little reason to use their paints in my experience. 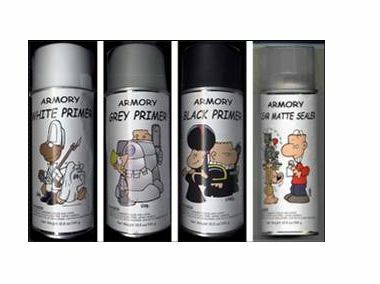 Things may have changed with their latest range of primers - I know the prices have gone up even further, I can't justify the cost. The big feature that Army Painter offers is a range of primer colors that match their paint range, this is a fantastic idea and I have used to great effect on my Shimazu clan warriors. I do have a big problem with their primers though and that is the finish is more hydrophobic than I would like to see. The result is that painting over these primers often results in the paint beading and being reluctant to adhere. A real shame is it is otherwise very well though out and executed. Urgh... so much regret here, most identifiable for the eye catching John Kovalic artwork on the cans, these primers are nice and cheap but don't adhere to the model surface well - they dry very quickly so often dust the model with powder rather than a layer of paint. If I do a part on varnishes - bring popcorn as I go into an epic rant about their varnish. These are put out by Alliance Game Distributors. Thinking of these as interchangeable is possibly going to invoke some ire in readers but for me, they generally all perform well, at a good price point. Available in most Auto shops and many general hardware stores, these paints are really designed for respraying cars / graffitiing railway arches depending on who you ask. I recommend getting ones formulated for plastic if you tend to paint plastics as it will help improve the adhesion. There are slight differences in the way they behave / drying time etc but I've never had a bad experience with them and would recommend them to anyone in the hobby. I am a fairly recent convert to airbrushing and pushing myself to use it as much as possible. One of the things that I have really taken to with airbrushing is using it for priming. I am still learning the best way to do this but it has allowed me to make zenithal priming the norm and ensure I have coverage exactly where I want and looking how I want. I have been using Stynylrez from Badger which has a latex finish which really helps it hold onto the model. It takes a while to properly cure but it adheres very well (including to the airbrush gun so make sure you really clean it out!). There are many other manufacturers but I have chosen to only speak to the ones I have experience of. None of these manufacturers have paid me in any way and these summary simply reflect my views. This has also been a much longer post than I originally intended - so I will leave brushes for my next post!